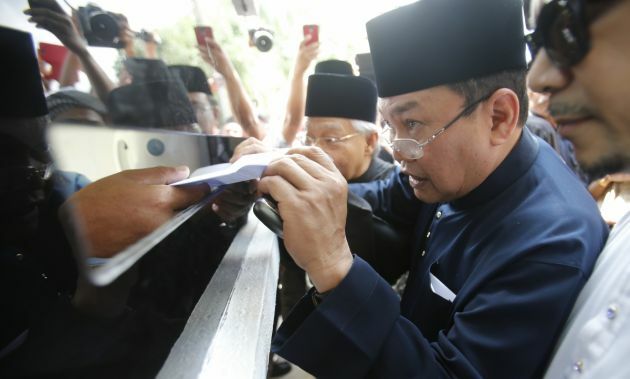 (Photo: REUTERS / Bazuki Muhammad)Muslim activist Ibrahim Ali hands in a statement in protest of Archbishop Joseph Marino, the Vatican's first envoy to Malaysia, at its embassy in Kuala Lumpur July 19, 2013. Marino opened a storm of controversy by apparently supporting the use of the word "Allah" by Christians, prompting a rebuke from the government and condemnation from nationalist Malay groups in the majority-Muslim country. KUALA LUMPUR (Reuters) - Malaysia's ruling party, stung by an election setback in May, is burnishing its Islamic credentials, aiming to gain ground among majority ethnic Malay voters in a move that could heighten concern over growing religious intolerance in the multi-racial Southeast Asian country. The coalition led by the United Malays National Organisation (UMNO) suffered its worst election result, hurt by the desertion of ethnic Chinese voters and many urban dwellers, including Muslim Malays, its traditional bedrock of support. Ahead of the party's annual general assembly this week, Prime Minister Najib Razak shored up his support by making concessions to the party's conservative wing, rolling back his previous liberal social reforms, boosting steps to favour ethnic Malays economically and stressing UMNO's role as a protector of the Islamic faith. That has enabled him to push forward with unpopular economic steps to tackle the country's chronic fiscal deficit, most recently the announcement of a 15 percent rise in electricity tariffs from January. "UMNO has been upholding Islam over tens of years, setting up Islamic universities and institutions of higher learning and establishing Islamic finance in this country," Najib told delegates in his keynote opening address on Thursday. "This is where the greatness of Islam is upheld." At the assembly, senior UMNO leaders called on the government to change the country's constitution to specify Malaysia's official religion as Sunni Islam, reflecting growing hostility to the spread of the Shia sect of Islam. The party also invited a popular Islamic preacher to join its decision-making Supreme Council, an offer he rejected. Religious tensions have flared since the election, with Najib's government voicing support for a court's ruling that only Muslims can use the word "Allah" to refer to God, despite Malaysian Christians having used the word for centuries. An UMNO member of parliament last month threw his support behind a long-held plan to introduce Islamic criminal law in Kelantan, a northeastern state governed by the opposition Islamist Pan-Malaysian Islamic Party (PAS). Meanwhile, the UMNO-controlled state of Johor bordering Singapore last month changed its official weekend to Friday and Saturday to accommodate Muslims' day of congregational prayer. "I think my leaders have completely lost the plot because our strength is as a centrist party, not being a religious or right-wing party," said Nur Jazlan Mohamed, an UMNO member of parliament in Johor who saw his majority shrink in May. He said the strategy was misguided because Malays were increasingly moving to urban areas, where they tended to be swayed less by religion and were more focused on governance issues, such as the corruption that has tainted UMNO. UMNO's moves come amid speculation it will hold talks with PAS, part of the Pakatan Rakyat opposition alliance led by former finance minister Anwar Ibrahim. PAS President Abdul Hadi Awang expressed willingness at the party's recent conference to discuss with UMNO how to implement a more Islam-based administration, sparking talk that a formal alliance between the two could be in the making. Such a deal would dramatically boost the ruling coalition's thin parliamentary majority, though analysts see it as unlikely. "Without Pakatan Rakyat, PAS would be left as just another Malay party on the fringes of UMNO," said Wan Saiful Wan Jan, head of Malaysia's Institute for Democracy and Economic Affairs. "It would defy all the hopes people have been putting in the party." Still, claiming the Islamic "high ground" held by PAS could help UMNO gather stronger backing from Malays, to make up for the dramatic loss of support from ethnic Chinese, who make up more than a quarter of the population. UMNO, which has ruled at the head of a multi-ethnic coalition since independence from Britain in 1957, has traditionally been a secular, business-oriented party. But the rise of PAS since its strong election performance in 1999 has pushed UMNO to become more religious, aggravating ethnic divisions and undermining Malaysia's international image as a standard-bearer of "moderate" Islam.